Lovely crisp exterior, gloriously gooey centre, this will wow all your guests whatever the occasion. In a spotlessly clean and dry bowl, whisk the egg whites to a medium peaks. Gradually add the sugar until incorporated and the meringue is thick and glossy. Be careful not to over whisk the whites. Gently fold in the cocoa with a large metal spoon. Spread the meringue out into a round, approximately 8 inch in diameter on the prepared baking sheet. Place on the middle shelf of the preheated oven, turn the temperature down to 110ºC and bake for 3-4 hours until the meringue is pale and crisp. Leave to cool completely in the oven. To assemble, drizzle the cooled meringue with half of the melted chocolate. 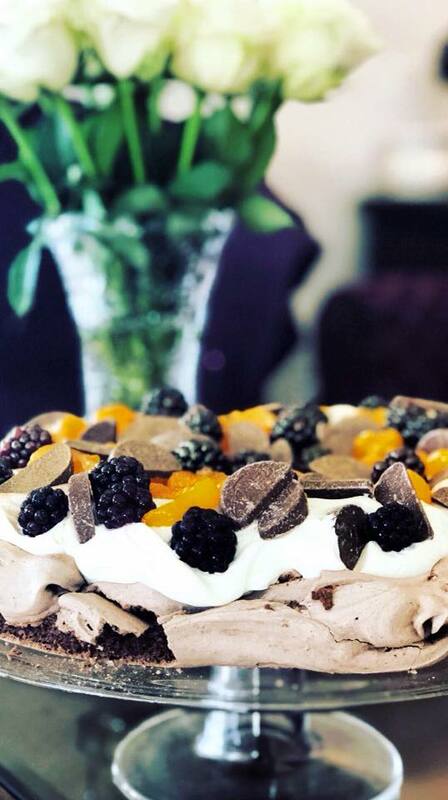 Fold the zest of the clementine into the whipped cream and pile into the centre of the pavlova. Top with the fruits and chocolate pieces drizzle with the remaining melted chocolate.